Locate Valldalen, this valley start at Nordalsfjorden/Tafjorden and runs north-east to the top of the famous Trollstigen road that connects further north to the village of Åndalsnes. About 6 kilometer up the valley, a side road forks north near a farm called Myklebost. 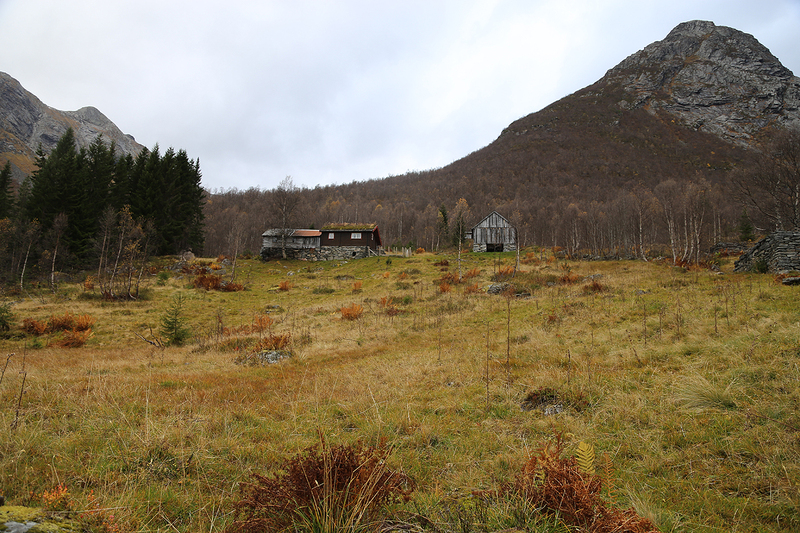 This toll road (NOK 50 in 2015), serves the mountain farm buildings named Myklebustseter. Drive this road until you arrive at a good size parking area. The road actually continues from here (across the river), however it is recommended to park at this point. This location is N62.35937, E007.35109, elevation about 400 meter. Continue along the farm road, across ther bridge and very shortly, up the gentle grass land where the Myklebust summer farm buildings are located. As you follow the main track, you will see a couple of signs for lake Brekkevatnet, this is the route to follow. 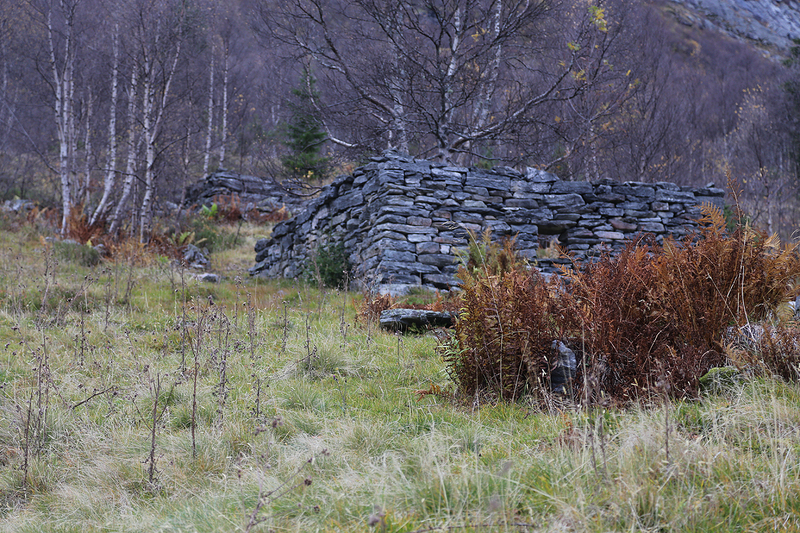 The trail sort of leaves the farm houses near an old ruin, only stone walls remain. Follow a very clear trail until just before it crosses the river Myklebustelva on a bridge. Shortly before, a small wooden arrow attached to a tree points towards the bridge. Fork left here and follow the vague track that heads into the forest. Follow this fairly horizontally until it emerges in a good sized open area. 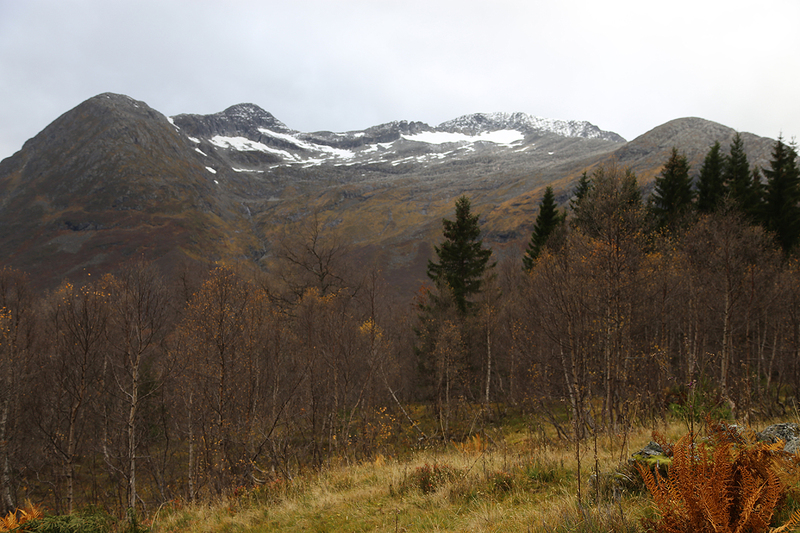 From here, one can find open space between the birch-trees leading uphill in order to enter the valley between Taskedalstinden and Brekkehornet. The trees end as this valley floor becomes less steep. Well before the slope again increases towards the pass between the tewo peaks, a broad and nice grass slope ascends to the left. Climb this slope, the terrain is easy to walk and oone may avoid rocks and indeed get almost all the way to the main south ridge while staying on moss and grass. The final, short stretch is easy navigation between rocks and small cliffs. Once on the ridge, turn right and walk along this very nice ridge. It gets steeper and turns into an interesting scramble. Not really difficult, long stretches can be walked. Fairly high up, you will run into a steeper cliff with a clear route (well protected) in the middle. Climb up here. Do not get tempted to try a bypass, you are much better off by doing this easy, short climb. On the top, you have two choices. There is an easy bypass along a broad ledge on your right. This route connects nicely back to the top ridge higher up. Alternatively, scramble up the along the top rocky ridge. You will now soon reach more gentle terrain. The ridge broadens into a small plateau and it is an easy walk across the rocks that now leads uphill to a very nice cairn on the top. This trip started out in a rather unfortunately way. 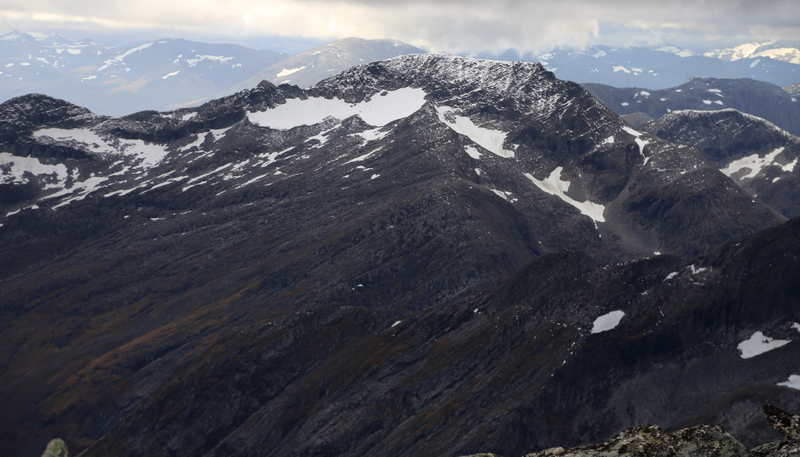 I initially decided to spend the night at Kanndalssetra above Eresfjord, then climb a peak there Sunday morning. However, in order to get back to Bergen in reasonable time, I suddenly redecided and drove down to Valldalen in order to attempt Taskedalstinden. 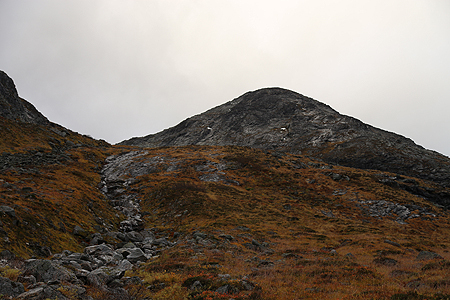 After arriving at this trailhead, I noticed that I had left my walking poles, my ice axe and my crampons outside the car back at Kanndalssetra. Bad news! I had to drive back to retrieve this equipment. Leaving the trailhead at 2230, it took me 4 hours (until 0230) and 280 kilometer of night driving to fix this very unfortunate oversight. Not surprisingly, it was already light when I woke up, a small over-sleep being justified after a rather unusual night. I started hiking at 0850 and soon came to the bridge that I decided not to cross. Instead, I headed directly uphill from the bridge, bushwalking pretty dense birch forest. It would have been smarter to walk back the few meter to the small wooden sign, then take the tiny trail, however, I was unaware of this possibility. After quite some struggle, I oticed the clearing a bit below on my right and descended there. 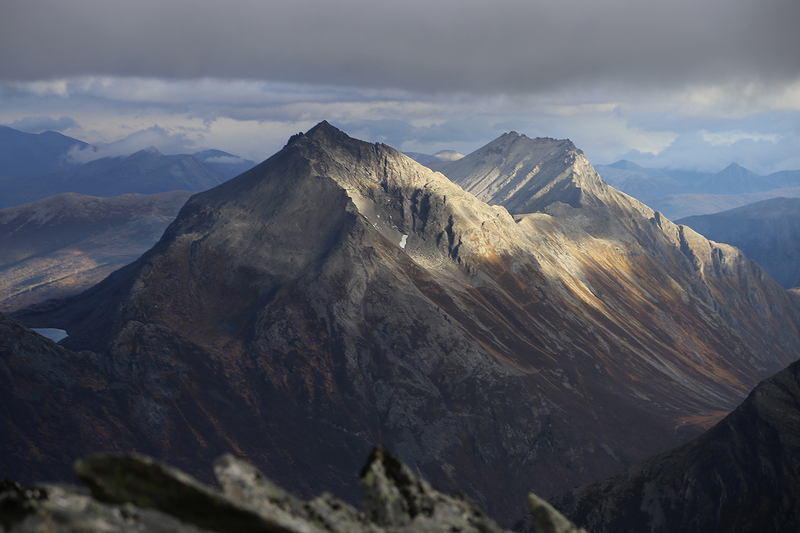 Hiking became easier and I ascended to the south ridge, arriving there at 0950. The ridge ahead looked just about right for a solo ascent. 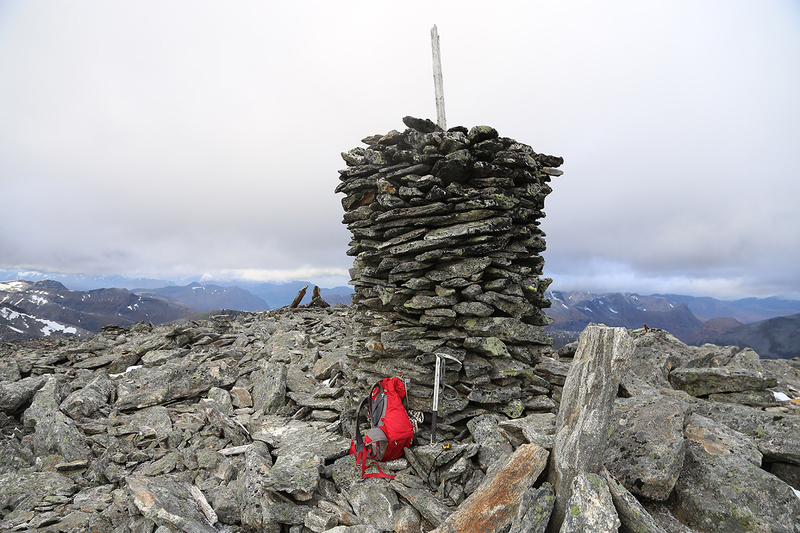 This turned out to be the case, a bit of exploring and no rush brought me to the summit cairn at 1050. The summit area as well as the last part of the ridge is a broad area, I stayed around until 1100. It was windy and a rest would be more pleasant a bit further down. I returned carefully back down the ridge and picked a much better line through the birch trees, emerging precisely where the small wooden sign had been placed. I was back at my car by 1320, what remained was a pretty nice drive back to Bergen where I arrived around 2030. 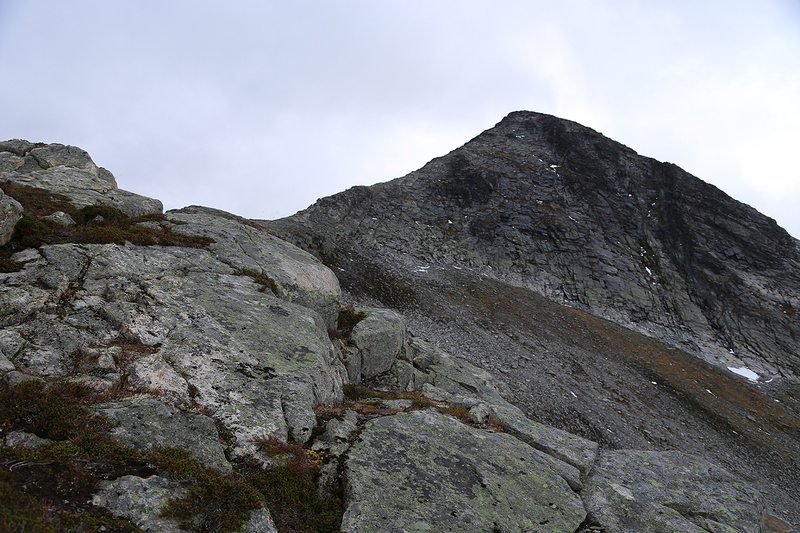 Seljebottstinden, as seen from Myklebustseter. 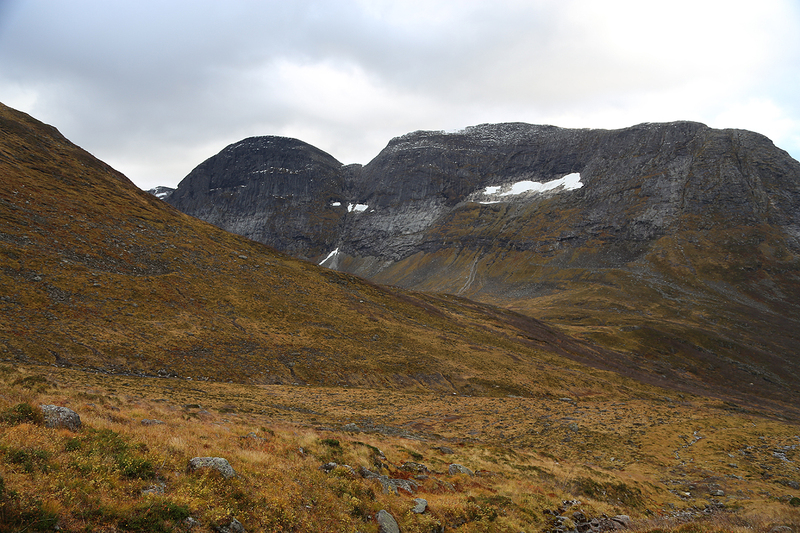 View into the valley with Brekkevatnet, while climbing the lower part. 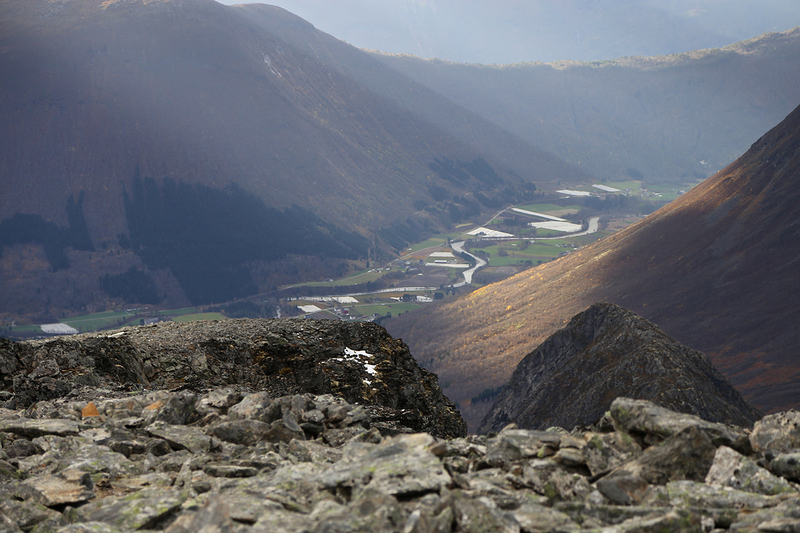 Valldalen, as seen from the mountain. 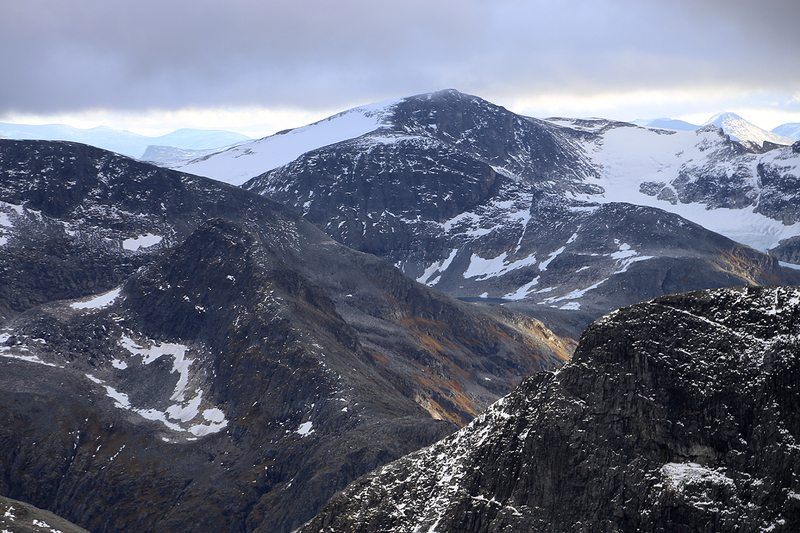 View north, Middagstinden and the ridge leading north-east. 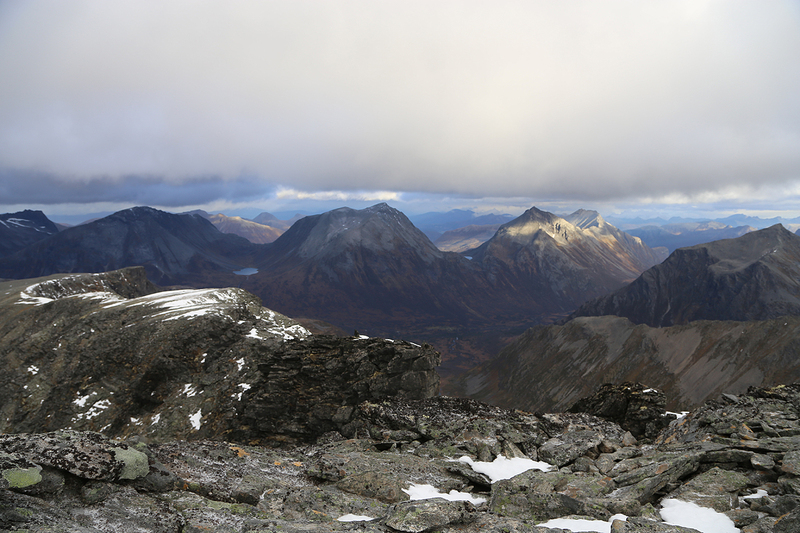 Seljebottstinden, as seen from the summit.